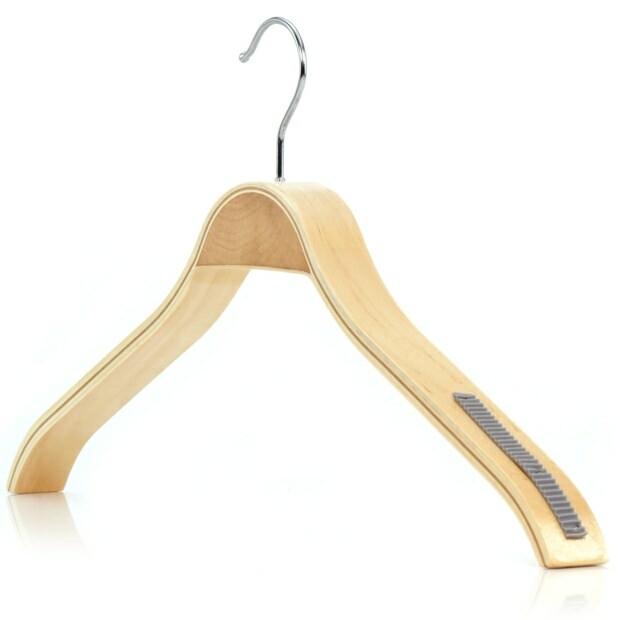 Superb quality heavy duty laminated hangers that are produced by joining multiple layers of wood, which increases strength and stability. Using different shades of wood in the layers and in the crescent shape at the neck, produces a contrast for a contemporary and stylish appearance. The smooth varnished finish means your clothes won't get snagged, which causes loose threads and quickens deterioration of your garments. Manufactured with contoured neck and shoulders that provide support and help keep your clothes in their proper shape. By providing your clothing with the correct support you will be reducing the amount of stress put on seams and stitching, therefore extending the life of your garments. The hanger comes with attractive, grey, ridged, non-slip strips on each shoulder that will prevent clothes from sliding off. Completed with an attractive, chrome, 360° swivel hook that enables you to position the hanger in any direction and neatly line up your clothes. The shaped neck and shoulders make this hanger ideal for displaying clothes in a retail setting, but are equally suited for home use. An exquisite product that’s suitable for hanging tops, t-shirts, shirts, blouses, and dresses, but the chunky broad profile makes them ideal for coats, and jackets. Chromed metal 360° swivel hook. Size: Width x Arm Depth 45cm x 3cm (18" x 1.2") approx.